Q1. What is the maximum amount of traffic that the IDSM-2 can monitor? Q2. Which of the following is false about the IDSM-2? A. It has the ability to monitor multiple VLANs. B. It impacts the switch performance. C. It runs the same code base as the appliance sensor. D. It supports improved management techniques (such as IDM). Q3. Which port on IDSM-2 is the command and control port? Q4. Which port on IDSM-2 is the TCP reset port? Q5. Which of the following IOS commands accesses an IDSM-2 located in slot 7? Q6. Which switch command can you use to check the status of the IDSM-2 in slot 5? Q7. What does a red status light-emitting diode (LED) on the front of the IDSM-2 indicate? A. The IDSM-2 is running through its boot and self-test diagnostic sequence. B. The IDSM-2 is disabled. C. A diagnostic other than an individual port test has failed. D. The IDSM-2 is in the shutdown state. Q8. Which of the following ports is an IDSM-2 monitoring port? Q9. Which IOS command changes the VLAN for a specific port on the switch? Q10. Which command do you use from the IDSM-2 CLI to shut down the device? Q11. What is the maximum amount of traffic that the IDSM-2 can monitor? Answer: The IDSM-2 can monitor a maximum of 600 Mbps. Q12. How many interfaces does the IDSM-2 have, and what are their functions? Answer: The IDSM-2 has four interfaces: two monitoring ports, one command and control port, and one TCP reset port. Q13. What version of CatOS must you run to use IDSM-2? Answer: To use IDSM-2, you must use Catalyst OS 7.5(1) or later. Q14. What version of IOS must you run to use IDSM-2? Answer: To use IDSM-2, you must use Cisco IOS Release 12.1(19)E or later. Q15. How does the operation of the IDSM-2 impact the switch’s performance? Answer: Since the IDSM-2 receives traffic directly from your switch’s backplane, it does not impact the performance of the Catalyst switch. Q16. Which switch command do you use to verify the IDSM-2 status? Answer: The show module switch command enables you to verify the status of the IDSM-2. Q17. Which two time-configuration options do you have for the IDSM-2? Answer: The IDSM-2 can be configured to either use the switch’s time or get time from an NTP server. Q18. If your IDSM-2 is in slot 6, what IOS switch command enables you to access the IDSM-2 CLI? Answer: The session slot 6 processor 1 command enables you to access the IDSM-2 in slot 6 on a switch running IOS. Q19. Which ports are monitoring ports on the IDSM-2? Answer: Ports 7 and 8 are monitoring ports on the IDSM-2. Q20. Which port is the command and control port on the IDSM-2? Answer: Port 2 is the command and control port on the IDSM-2. Q21. Which port is the TCP reset port on the IDSM-2? Q22. What does a red status LED on the IDSM-2 indicate? Answer: A red status LED on the IDSM-2 indicates that a diagnostic other than an individual port test has failed. Q23. What does an amber status LED on the IDSM-2 indicate? 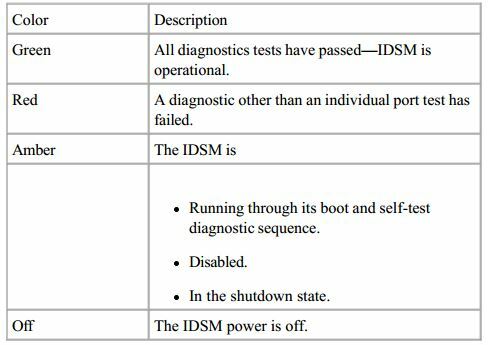 Answer: An amber status LED on the IDSM-2 indicates that the IDSM is running through its boot and self-test diagnostic sequence, it is disabled, or it is shut down.